Supporters are asked to join our call by taking a moment to write to the federal transport minister Hon. Marc Garneau asking for action. Tell him why it is important to you. We encourage you to cc your provincial transport minister, your MP, your MLA and your local municipal/band council member. 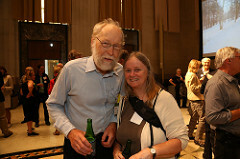 To keep us in the loop, cc Clifford Maynes cmaynes@greencommunitiescanada.org and Anders Swanson info@canadabikes.org. In 2018, the Council of Ministers Responsible for Transportation and Highway Safety (COMT) released a report titled Active Transportation: A Survey of Policies, Programs and Experience. COMT is a national level body that coordinates research and policy development among federal and provincial transportation authorities. The council includes every provincial minister, deputy minister and their colleagues at Transport Canada. Knowing what a coordinated approach to active transportation will do for Canada, we know there is an important role. 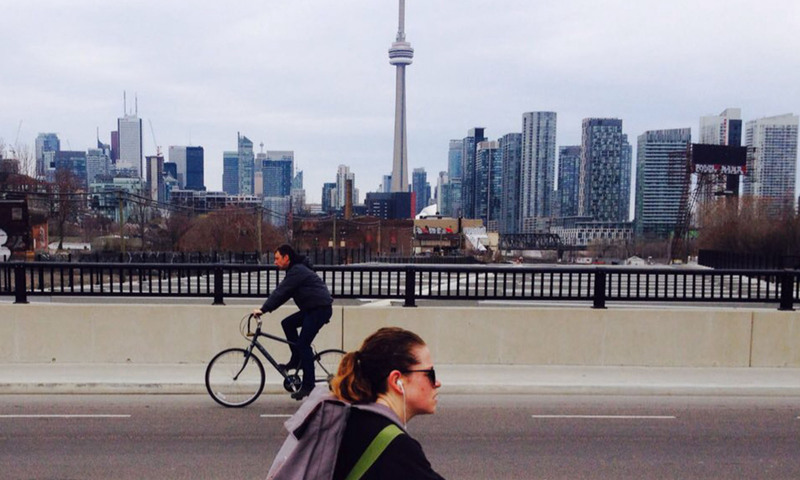 What is and what could be the federal role in active transportation? The extent of the federal government’s involvement in active transportation is something it is free to define. For example, local governments implement local infrastructure but often with funding support from other levels, with provincial and federal agencies involved in projects and areas that fall within their mandate and interest. Examples of federal government involvement in active transportation over the last few decades can be found across Canada in everything from services and programs to bridges with bike lanes. However, while the federal role in motor vehicle is quite clearly understood by most people, the lack of coordinated effort and oversight of active transportation is clear. Currently, the Government of Canada sets major infrastructure funding priorities (see P.T.I.F. for example) and signs international agreements (see the Paris Agreement) whose outcomes and effectiveness are directly affected by how well we manage active transportation. The mandates of numerous departments and agencies within the federal government clearly show that we could/would benefit immensely from increased active transportation focus. We know much more about what we should be doing than we actually do, however. This 2017 report by our Chief Public Health Officer, entitled “Designing Healthy Living” is just one obvious example of the potential payoff and importance. 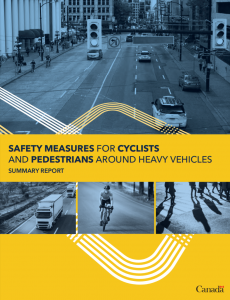 Transport Canada, through the first ever Vulnerable Road Users Task Force, recently studied road safety for cycling and walking and identified a long list of countermeasures that need to be acted on in its summary report. We are just getting started. Consider this: as the largest single employer in Canada, the federal government itself would greatly benefit from a strategy intended to get its own employees safely to work using bicycles or other modes of sustainable transportation. Making it happen requires a multi-billion dollar investment in safe infrastructure and collaboration with all levels of government. But it would be worth it. That investment has a return. he productivity benefits – based on abundant research about the impact on sick days, mental health and personal finances – mean that an internal active transportation strategy alone would have an impact on every thing the federal government does. That’s why large, national-level research and policy development organizations whose work includes the struggle to contain chronic disease or advocating for reduced trauma and road violence believe a large, dedicate fund just for active transportation projects is in the national interest and that it is something we can easily afford. And yet we lack clear direction at the federal level. Canada does not have a ministerial mandate letters that clearly state who is responsible for active transportation. Canada does not have a coordinated national effort to advance active transportation or national targets for biking or walking mode share. We do not even clearly know how many children bike to school – nor are we capable of coordinated policies and programs to do something about it. As a result, we lag far behind peer countries in the number of people who walk to school, ride bicycles for transportation and the level of death and injury they face per km of travel. To see what municipalities across Canada are asking for, see this important motion passed by FCM Council in June 2018 calling for federal leadership describes a specific set of actions to take. 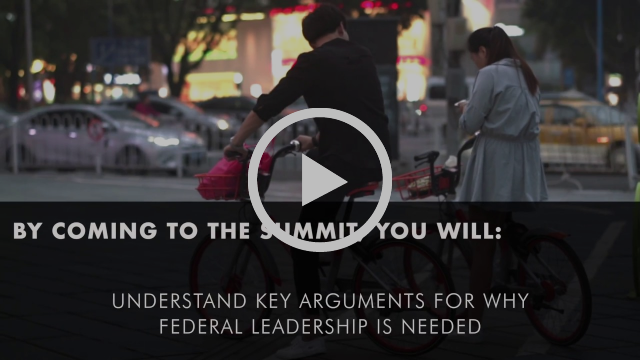 Have a look at the Vélo Canada Bikes position paper on the federal role in cycling . Finally, to see what is happening around the world, have a look at this listing of countries with a national cycling strategies. On November 30, Canada lost a passionate bike advocate. One of our founding members, Arno was involved in many organisations including Vancouver Area Cycling Coalition (now HUB), the BC Cycling Coalition and even dipped his toes in politics as a Green Party candidate. Known for his gentle nature even when pushing for change, Arno dedicated countless hours volunteering for a National Cycling Strategy with Vélo Canada Bikes. Van Bikes recently updated a blog detailing Arno’s advocacy history, and a ride celebrating his life and legacy was held on December 8th. Several articles have come out in the weeks since his death, each one highlighting what a national treasure Arno was. 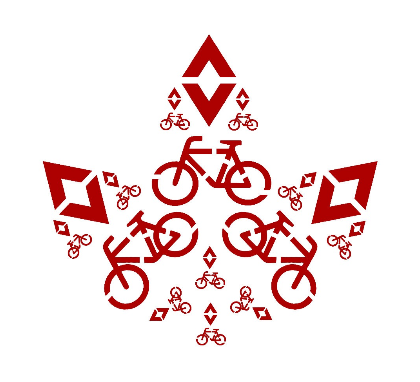 Vélo Canada Bikes. Nothing would celebrate his life more than a Bike Friendly Canada. We have all lost a great leader in cycling in Canada, BC and Vancouver. Really amazing all the great work Arno did. His passion and positive attitude was really inspiring. So power, gentle and kind. He is really missed. 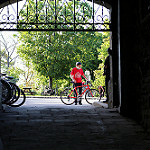 I will always remember him as a timeless advocate for cycling and as a gentle and elder statesman of the bike movement. 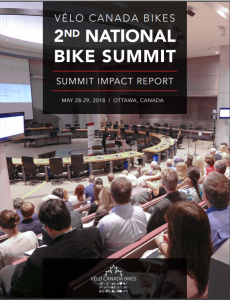 Interested in becoming a sponsor for the 2019 National Bike Summit May 13-14 in Ottawa, Canada? The summit sponsorship package is available now. 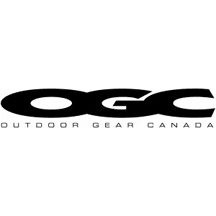 Thank you to our returning sponsors The Co-operators, Outdoor Gear Canada, SRAM, and more! We are also thrilled to announce Shimano Canada as the event’s gold sponsor this year. You’ll hear lots more as we continue to work on the event. If you want to learn more about the conference itself and get a few preliminary details, see the save the date message. When a country isn’t bike friendly, women are the first to be left behind. Cycling presents a unique opportunity to address a range of economic and practical disadvantages acutely felt by women in society. There is, therefore, an urgent need to make cycling more practical and accessible in Canada – especially for women and girls. Transportation is currently the top barrier to education and employment for women. Women are more likely to run errands before/after work. Overall, their travel patterns vary considerably from those of men. As a result, they struggle to integrate within transportation systems planned by men which focus on rush hour trips. Conflicting schedule pattens mean that women are disproportionately affected by seemingly minor details experienced by men: this includes lack of public transport availability at off peak hours and a lack of provision of infrastructure in both suburban and urban areas for modes of travel that require frequent short trips. Men are more likely to drive straight to a single destination while women tend to make more trips with brief stops where additional time lost to parking is relatively inconvenient. The economic and time pressure felt by women is compounded by the fact that women tend to make less money per hour while they are working. Women and girls are also less likely to meet the recommended amounts of physical activity than men and boys due to lower levels of participation in organized sports and other factors, making the moderate physical activity that would arise from the everyday physical activity of cycling disproportionately important for both personal and public health reasons. All of these factors combine to increase the practicality, desirability and impact of a cost effective and efficient independent transportation solution ideal for medium range distances (1-7km) with little to no operating costs or wasted time from parking. Such functionality is uniquely embodied by bicycles and cargo bikes alone. This likely explains why, in countries with similar climates that have created the circumstances conducive to safe, convenient and comfortable everyday practical cycling, cycling rates for women are many times higher then we find here, to the point where women outnumber men. In Canada, even though a bicycle would be particularly advantageous for them, women tend not to ride – especially in dense urban neighbourhoods where it would be most practical and where it would offer the most potential to achieve overarching government priorities such as greenhouse gas emission abatement and poverty reduction through increased accessibility. The solution is almost certainly the provision of safe and comfortable infrastructure. Women’s perceptions of cycling have additional effects on other demographics since women act as major influencers on those around them. For example, women’s current perception of cycling in general is almost certainly devaluing the bicycle tourism industry in Canada, since women are overwhelmingly the arbiter of a family’s tourism spending and make key travel habit choices during leisure times. The ingrained perceptions of women are also likely having an effect on the intergenerational transmission of transportation habits since women tend to spend more time with younger children and have more influence on large household purchasing decisions (such as automobiles or a housing). Other factors, such as a lack of representation in culture and in the bicycle industry are ancillary compounding factors to be addressed. VCB calls upon the Government of Canada to invest in cycling to promote gender equity. One way to do this is to support our call for a National Cycling Strategy and dedicated infrastructure funds to support cycling. “A lack of transportation options can be a barrier to the full economic participation of women. Access to public transit systems plays an important role in supporting women’s ability to access the workforce, as well as supporting services and resources, such as health services and childcare. . . . transportation is the number one barrier to … accessing educational opportunities, and accessing employment.” In urban settings, the cost of public transit and the lack of suitable schedules are barriers to the economic participation of women. In northern, rural and remote communities, there is often an absence of public transit which can be a problem for women who may not be able to afford a car. That the Government of Canada expand the eligibility requirements of the Public Transit Infrastructure Fund to include not-for-profit and non‑governmental community transit organizations, where municipally funded transportation services are not available. That the Government of Canada, immediately and on an ongoing basis, increase investment in public transportation that will ensure affordable, accessible, frequent and safe transit services for women. “Our MIssion: To serve the public interest through the promotion of a safe and secure, efficient and environmentally responsible transportation system in Canada. Our Vision: A transportation system in Canada that is recognized worldwide as safe and secure, efficient and environmentally responsible. 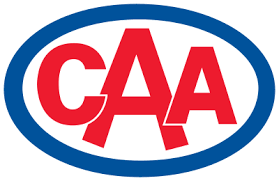 Vélo Canada Bikes has been taking part in the Transport Canada work as members of the Vulnerable Road Users Heavy Vehicle Advisory Committee for the last two years. The summary report has just been released, and the steering committee is looking at next steps. Missed the 2018 National Bike Summit? Get a taste of what you missed here! Per your requests, a printable version now available. Conference call: using ClickMeeting with dial-in option. Please try to connect up to 15 minutes prior to meeting start so that we can sort out any connection problems prior to meeting start. Our AGM is coming up. Each year a few board member positions open up and we would love to hear from you. If you think cycling is good for Canada and are interested in joining a motivated board doing important work, why not get involved? See complete information on qualifications, time commitment and how to apply. In June 2018, at the FCM annual conference in Halifax, FCM council approved this important motion. The decision was nearly unanimous and it is not hard to see why. · Ensure continued long-term federal investment in AT infrastructure. What can you do? Send a link to the motion to your MP and ask them what the Government of Canada is doing about it. Don’t miss this unique chance to meet, share and learn from others from across Canada that are passionate about how cycling can transform our communities and country! Following the success of the First National Bike Summit held in Ottawa on June 1st, 2017, Vèlo Canada Bikes is pleased to announce we will be hosting a two day event this year onMay 28th and 29th. See our exciting line-up here! Registration is now open. 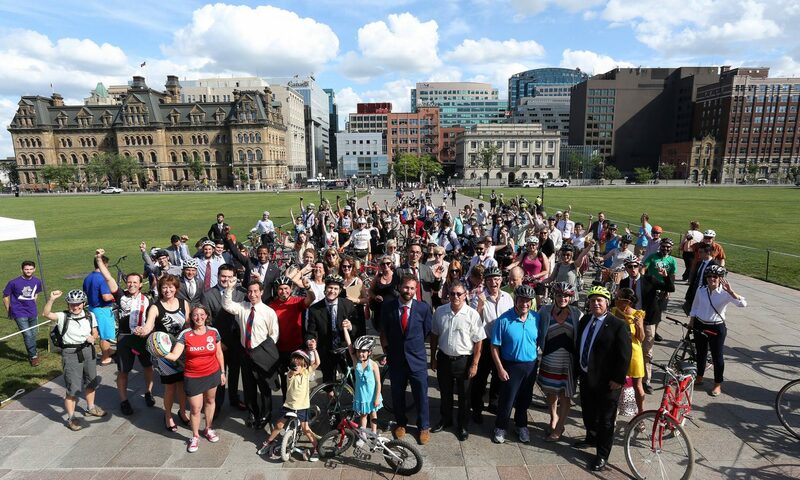 BONUS: Participants who register before April 15th will be included in a morning of meetings with Members of Parliament, Senators and other national representatives to move the bike-friendly agenda forward. Add your voice to the pan-Canadian call for safe, convenient, accessible cycling for all ages and abilities! Made possible with the generous support of our s ponsors. 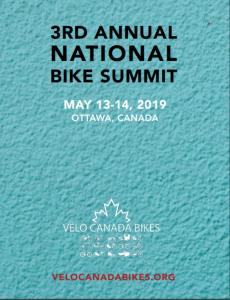 Vélo Canada Bikes invites you to submit an abstract to present at the 2nd National Bike Summit. 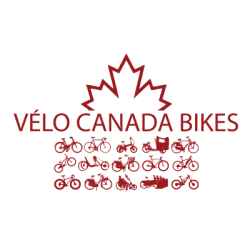 Vélo Canada Bikes is a pan-Canadian non-profit organization that advocates for increased federal support for everyday cycling in Canada. Our vision is a Canada where people of all ages and abilities can cycle safely and conveniently, in any community, for work, school, everyday errands, or leisure. During the summit we will gather with politicians, researchers, private and public sector cycling supporters to discuss how to create a bike friendly Canada. As part of the event we want to demonstrate that Canada is ready for a federally led National Cycling Strategy, and will be showcasing cycling research from across the country and beyond. The format for presentations will be posters, and the deadline for submitting an abstract is11:59pm ET on March 15th, 2018. Research may have been previously presented at other conferences and/or workshops, and may be presented in French or English. The word limit for the abstracts is 250 words (not including title, references, author information, and city/province). Abstracts should clearly state (1) the purpose of the research, (2) the methods used, (3) results or expected finds, and (4) conclusions and next steps. 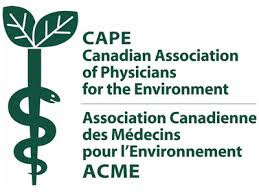 Please include at the top the abstract: the study title, the author names, the affiliated institution/organization, the city/province, and the authors’ email addresses. Please submit your abstract using this google form. For more information, please see full details here. The 2016 ParticipAction Report Card on Physical Activity for Children and Youth shows that we are failing Canadian children in sedentary lifestyles (F), overall physical activity (D-) and active transportation (D). 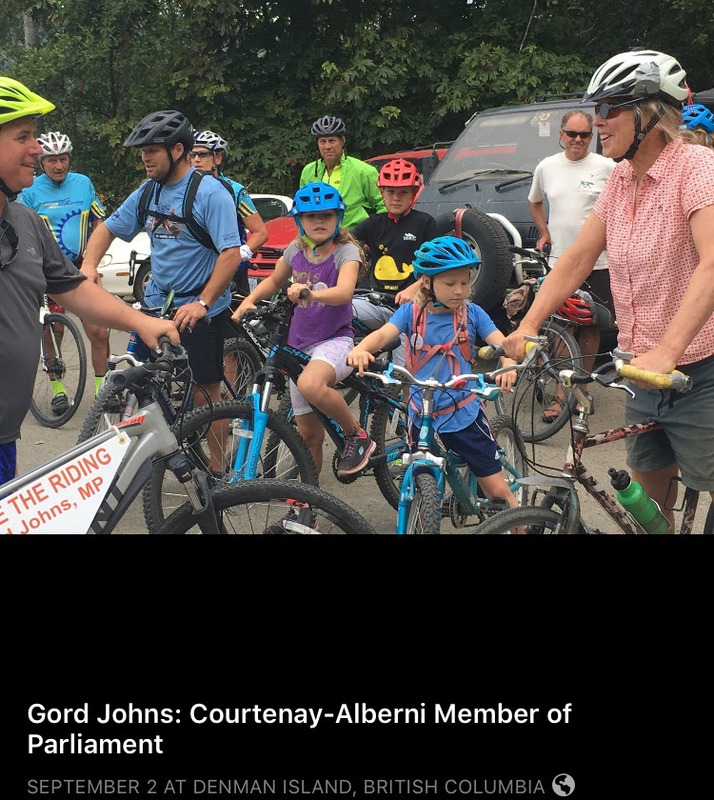 We, the undersigned, residents of Canada, call upon the Government of Canada to support Bill C-312 tabled by Gord Johns on October 4th, 2016, and enact a National Cycling Strategy Act. Not going to be in Ottawa for Bike Day on the Hill? 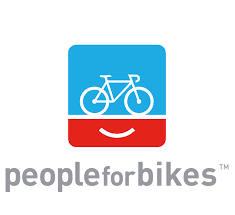 Canada Bikes invites all Canadians to organise a Ride Your Riding event in your community. 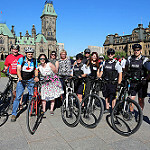 Please invite your local federal, provincial and municipal elected officials to join your community for a bike ride over the summer to continue the conversation. When the Liberals hinted that a “Gender Equality Budget” was going to be announced on February 27th, Vèlo Canada Bikes started speculating what that would mean for cycling infrastructure, especially with news reports that Swedish Finance Minister Magdalena Andersson had been consulted by Finance Minister Bill Morneau. 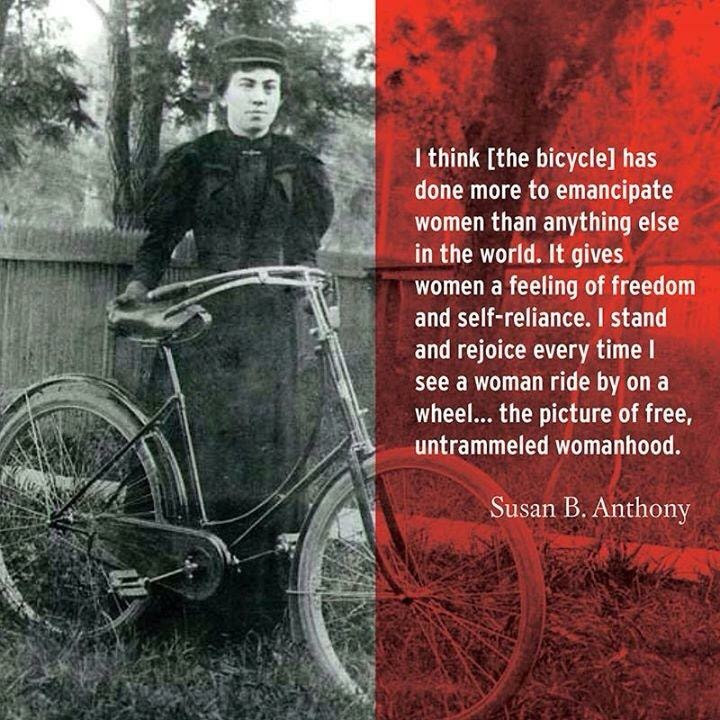 We know through studies, women are less likely to choose to bike without separated infrastructures. We see these numbers reflected in Canadian census data, as well as municipal transportation reports across the country. In fact, Statistics Canada reports that males were more likely to have ridden a bike within the last year (46% compared to 34%). When the “gender equality budget” was announced and did not address active transportation in any way, one has to wonder how this was missed. This becomes an even harder pill to swallow when you see the statistics of women cycling in countries that have addressed the gender gap with a national cycling strategy, including Sweden, Germany, Denmark and Germany. We love to highlight exciting events, projects, news and ways you can ACT from across Canada. 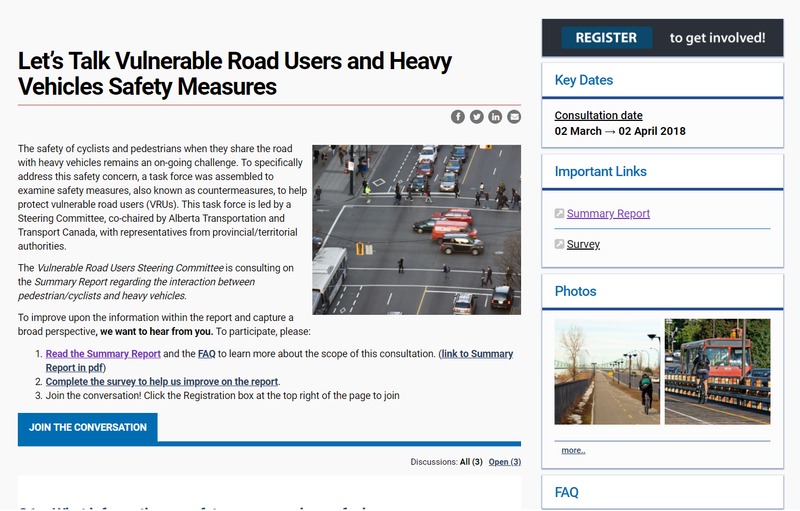 A steering committee, co-chaired by Alberta Transport and Transport Canada is conducting public consultations on a summary report that discusses countermeasures, or safety measures, designed to help keep pedestrians and cyclists safe when they interact with heavy vehicles. The link provided will give you access to an interactive website where you can read the report, participate in a discussion forum and/or complete a survey. In Halifax, there were 2 recent wins! Snow clearing will be getting a closer look after a motion to improve quality standards and timelines for all active modes passed in the Transportation Standing Committee. They also made some headway on the South Park Bike Lanes. Our friends Sustainable Calgary, Montrèal Urban Ecology Centre and Toronto Centre for Active Transportation have collaborated on a new project Co-Designing The Active City including a valuable community tool box. Winter Cycling Congress announces it will return to Canada for 2019. Plan a winter get-away to Calgary, Alberta for next year. UNSM hosts the Atlantic Canada Active Transportation Summit May 23-24th. Do you have a story of interest or an event you would like to share? Emailcommunications@canadabikes.org to have it included.